Love boating, hiking, horses and all those great outdoor activities? 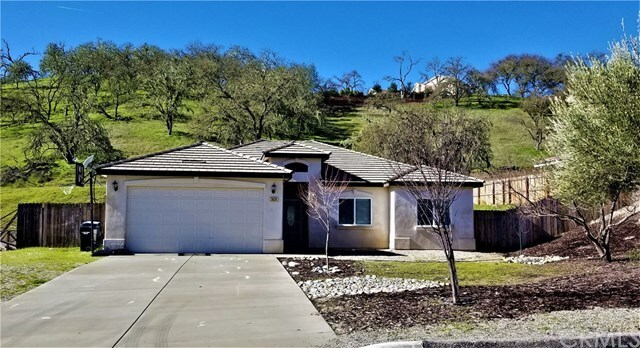 Then you will love this fantastic home in the wonderful gated community of Heritage Ranch at Lake Nacimiento! Upon entering this lovely 4 bedroom, 2 bath home, you will immediately notice the open and bright floor plan along with the beautiful engineered hardwood flooring. The kitchen,with its granite counter tops, stainless steel appliances, lots of cabinetry and eat-in breakfast bar offers plenty of space for the chef and family to gather. Enjoy the comfortable living room with fireplace as it opens nicely to the kitchen and dining area with sliders leading out to the covered patio and backyard area. The spacious, private master suite gives you granite counter dual sink vanity, walk-in tile shower, soaking tub, tile floors and walk-in closet. The master suite also features sliders that lead out to the back patio and yard area. In addition, there are three more nice size bedrooms on the other side of the home with a full guest bath. Relax on the private covered back patio with fan and take in the sunsets, deer, hawks and other visiting wildlife. The 2-car over sized garage features plenty of room for your boat along with cabinets and work shop area. Heritage Ranch amenities include two pools, tennis courts, recreational buildings, horse facilities, lake access and so much more! Start enjoying the good life at the lake! Seller is offering a $10,000 landscape credit. Call your Realtor for more info! Directions: Nacimiento Lake Road to G14. G14 to Heritage Ranch.